It is not enough to write that Tristan und Isolde is a dramatization of Richard Wagner’s relationship with Mathilde Wesendonck; nor is it enough to write that it is simply an absolute exaltation of love. The opera is an idealization of love that goes beyond the human experience to a metaphysical exploration of love that defies societal conventions and yearns for death as the only acceptable form of true unification between the two lovers. While there is only one dramatic element – the drinking of the love potion, the lovers being caught by King Marke and the courtiers, and Isolde’s return to the dying Tristan – happening in each of the acts, the entire four-hour and forty-five minute Washington National Opera production, directed by Neil Armfield, is an all-encompassing love story both dramatically and musically. The distinguished series of descending half-steps posited by the cellos in the Liebestod, with Philippe Auguin at the helm of the orchestra, held each listener rapt. Every musical element of Richard Wagner’s Tristan und Isolde is composed to illustrate the construction and intensification of tension. Auguin took his time with each revelation of the ‘Tristan chord’ while the curtain rose at a deliciously slow pace to reveal a raked platform hovering over water surrounded by long, white, billowing curtains. 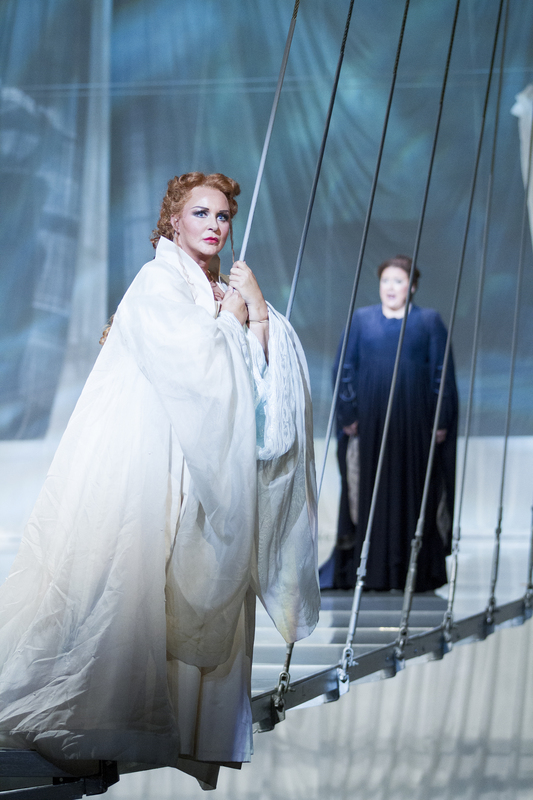 Iréne Theorin as Isolde met Ian Storey, her Tristan, upstage center before she floated just as slowly down the stage during which the musical tensions ascended toward the promised but ever elusive fulfillment. Theorin’s chilling “Let Death now give her thanks!” (Act I Scene 4) set a tone for the comprehensive range of emotion she is able to elicit which broke through to incredible warmth in the next scene after Tristan and Isolde drink the assumed poison. The two lovers sang a glorious “Tristan! – Isolde! Treuloser Holder!” upon the set entirely bathed in blue light. In contrast to her steely composure in Act I, Theorin was able to show Isolde as playful and childlike, awaiting her beloved, in the beginning of Act II. Thereafter, Theorin and Storey portrayed the intoxicating, improvident, and ultimately consuming power of the Wagnerian ideal of love: two bodies, two identities completely merged. Finally, Theorin sang the Verklärung with intimate grace yielding to powerful, soaring vocalism over the lush orchestral texture. Elizabeth Bishop as Brangäne inspired true pathos for Tristan and Isolde as well as Kurwenal, sung with impressive power by James Rutherford, in the final scenes. Bishop demonstrated an intensely rich vocal line during Brangäne’s Wachtsong, sung off-stage, while fusing with the orchestral fabric. The male chorus also sang with ease and respectable power while adding interesting shadow work behind the massive fabric panels. Although this orchestra is not as sizable as those called for in The Ring, there were moments that the surge of sound from the orchestra overtook the middle range of the singers and could have stood to be more nuanced in their approach. However, the orchestra was also incredibly sensitive to the singers as they displayed their most expressive pianissimo sections. Also, the use of the rare Holztrompete was a special feature. Theodor Adorno writes[³], “This intermediate stratum of expression…did not exist before Wagner. That suffering can be sweet, and that the poles of pleasure and pain are not rigidly opposed to one another, but are mediated, is something that both composers and audience learned uniquely from him… And few aspects of Wagner’s music have been as seductive as the enjoyment of pain.” It is this intermingling of the sublime passion of love and pain of death that makes the Washington National Opera production, especially in the voice of Iréne Theorin, so captivating. Tristan and Isolde opened on Sunday, September 15. The remaining performance dates are September 21, 24, and 27. This production marks the first opera in WNO’s commitment to showcasing the operas of Richard Wagner in advance of the company’s complete staging of Wagner’s epic four-part Ring cycle, directed by WNO Artistic Director Francesca Zambello, in the spring of 2016. The ending of Tristan und Isolde beginning from Isolde’s ‘Mild und leise’ are often referred to as the ‘Liebestod.’ This review will use Wagner’s references to the passages as Liebestod/Prelude and Verklärung/Isolde’s Transfiguration. Washington National Opera originally cast Deborah Voigt in the role. Her withdrawal was announced on September 7th, 2013. That’s a good point! There is much in the way of sweet dissonance to lift up the beauty in both pleasure and pain in madrigals. I mean, Gesualdo, that’s all you have to say. Great article! Dutch National Opera is doing this season the complete Ring cycle and I am enjoying the unique opportunity to hear so many extraordinary singers. Looking forward to your other reports/reviews! Thank you! I’m also really looking forward to seeing the whole Ring. What an experience. It’s also great to meet the audience members at these performances that are such supporters of Wagner’s work. They are so committed!